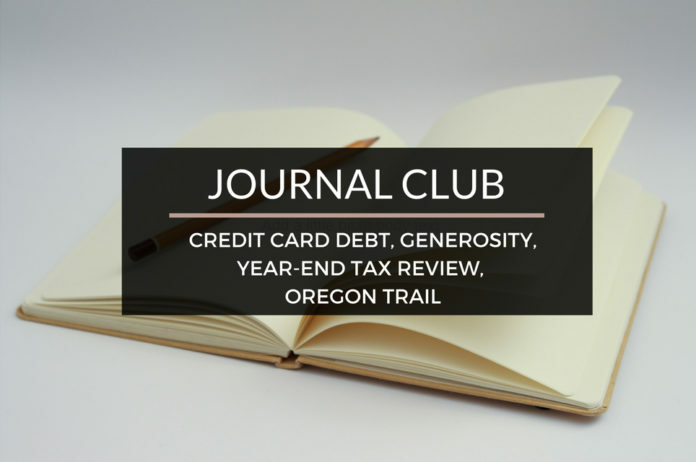 Journal Club 11-26-16 | Passive Income M.D. Every week, I hold a JOURNAL CLUB. After manually filtering through the millions of articles out there, I present a few that I impacted my life this week. This will also help lay the foundation for some of the topics that we’ll dig into deeper on this website. I don’t think I know another doctor who uses credit card debt to her advantage as well as Dr. Wise Money. Here are some of the reasons she focuses on being so savvy with it in 5 Reasons Credit Card Debt Trumps Student Loans. It’s not always easy to be generous. That’s why it’s so amazing and inspirational to hear this story from my fellow anesthesiologist and financial blogger, Physician on Fire. read how he’s committing to a huge donation and does it in such a smart way in The Best Way to Donate A Hundred Grand. On the subject of generosity, if you’ve ever thought you don’t have enough to give to make a real impact, then check out this post by Bayalis Is The Answer. It’s a great one, check out Harnessing Geographical Arbitrage for Giving. I can’t believe it’s almost the end of the year. Smart tax planning makes all the difference so makes sure you have things in order and take a look at Future Proof M.D.’s post, 2016 Year End Tax Tune Up. Who didn’t love the game Oregon Trail back in the day? If you’re thinking, “What’s Oregon Trail?” then I’m getting old. Besides teaching us how to shoot buffalo and making huge life decisions like whether you should ford the river or not, apparently there were deeper lessons involved as well. Get ready for some major nostalgia in the post by Keep Thrifty, Money and Life Lessons From The Oregon Trail. Every year I seem to have more and more things to be thankful for. This year was no exception with the addition of a new kid to the already crazy house. Taking a day and a weekend to remember all that I have to be grateful for has been awesome… It also helps that I didn’t have to work all weekend. Hope everyone has had a great Thanksgiving holiday! Contract Diagnostics is the country’s only firm 100% dedicated to Physician Contract Reviews. Their proprietary review process focuses around educating their Physician clients on how to negotiate and ask for things, what specifically to ask for, and an overall view of the ‘deal’. Not a law firm, they provide overall ‘deal’ advice in a much more comprehensive manner than a traditional lawyer would. While their attorney’s review every contract, it is presented in a much different way based on your specific situation. Private Practice vs Hospital employed? Hospitalist vs Trauma Surgeon? California vs Florida…they are familiar with all the nuances of each specific situation and would love to help with yours.